Well, the first month of the new year has come and gone. For most it’s the least favorite month of the year; the excitement of Christmas gone and still a long time until it starts to feel like summer again. But for me, its the lack of sailing that I hate the most. The boat is out the water and receiving some TLC which is a necessary part of most racing yachts in order for them to be competitive. But it feels odd to be spending so much time in the office rather than on the water. That being said there are benefits of being stuck on land. I am writing this in the middle of a typical day campaigning for the Transat Jaques Vabres race a little over 8 months away. Sam and I have spent the morning emailing, calling and contacting the people we met at last nights networking event whilst watch Louis Burton finish 7th place in the Vendee Globe. We are now about to go and learn about how the hydraulic rams (Which kant the keel over) go together as they get put back into to the boat after a service. Hopefully also how to fix them in the event of a breakage. I have also been able to spend a lot more time working on fitness. Having had a physical assessment from our University of Southampton coach Chris Szedlak, he has given us a number of routines to chip away at in the gym. It’s the perfect time of year to be working on this before the season really kicks off. Next week I will get my chance to get sailing again as I am off to warmer waters. 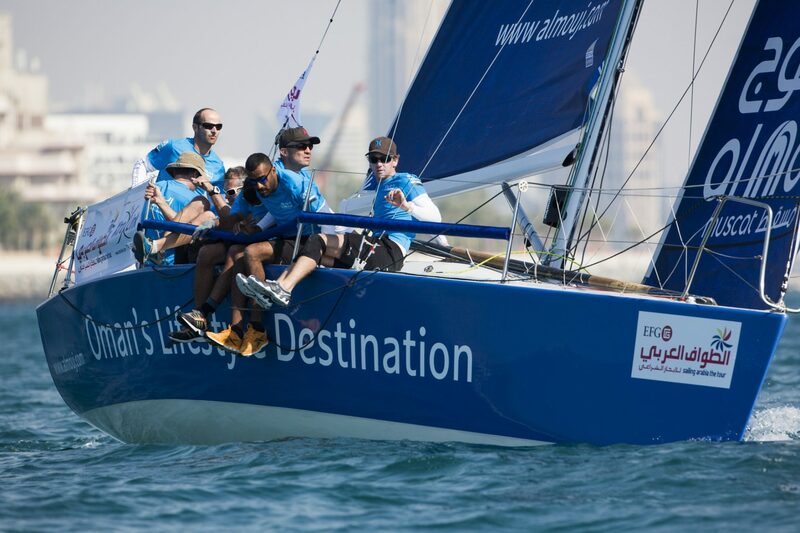 I will be competing in the Sailing Arabia the Tour with the team Al Mouj. It is basically a 3-week long event starting in Oman and finishing in Dubai and stopping at 4 major middle east cities. The racing is intense as each of the 5 stages of the race are only 100 or so miles long and typically very light and tricky winds. Al Mouj team consists of myself, four french sailors and 2 Omani sailors so I think we have scored full points for internationalism. We will be racing in identical Farr 30 yachts, very similar to the Figaro except that there are 6 people on board rather than 1. I will have to get used to working as a team on the boat and potentially in a different language at the same time. But I am excited as I have never been to this part of the world and am looking forward to some close racing with some very good sailors.